Bacon, lettuce, egg and cheese sandwich. Sometimes it's just nice to hack up something quickly, and not worry about bugs in the resulting product. Bacon Lettuce Egg and Cheese Sandwich, originally uploaded by flyingroc. Though I did thoroughly wash the lettuce, just in case it has bugs. 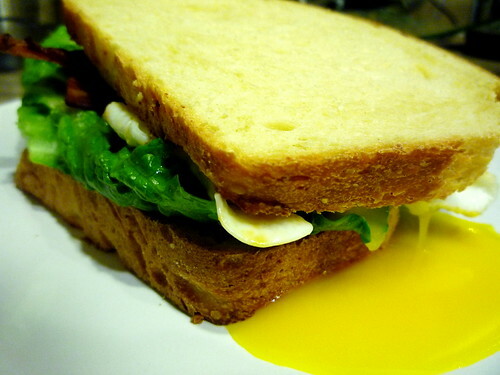 Haha, yeah, the yolk broke as I was transferring the egg to the sandwich, but I like it runny. You can mop it up with the bread. Mmmmm.